“Unreal Kart” is a fun, fast-paced Unreal Tournament 3 Deathmatch level based on Quake 3 Arena’s classic DM-17, but with a Mario Kart-style twist. Just as in DM-17, players can use jump pads (re-styled as springy mushrooms) to bounce around the level and duel with Rocket Launchers. However, they can also race around the kart track on their "karts" (Hoverboards), gaining access to special weapons and powerups such as the Shield Belt, Stinger Minigun, Flak Cannon, and U-Damage, and providing additional approach angles against pesky snipers at the far ends of the track. Despite a wildly different aesthetic and several major new gameplay elements, Unreal Kart stays true to many of the iconic elements of the original DM-17. DM-17's most salient feature is its tiered, jump pad-heavy layout. Unreal Kart preserves DM-17's four-tiered structure, and contains all of DM-17's signature jumps, such as the central quad jump, the armor arc, the long jump to the sniping platform, and the double bounce to the top level. Hoverboards are one of the key unique features of Unreal Kart. Players can use them to zip quickly around the track, giving them access to more powerful weapons and powerups then those available in the center or on the sniping platforms. A series of yellow boost panels allow hoverboarders to move even faster, while a number of mushroom embankments, such as the one on shown here, include jump pads that provide quick routes back to the center of the level. These elements ensure that players can utilize the racetrack without spending too much time away from combat hotspots. More details on hoverboard implementation are available on my Kismet scripting page. The original DM-17 features a sniping platform that is only accessible from one direction, via a jump pad from the central structure. This makes approaching a sniper already set up on the platform difficult. However, this is mitigated by the lack of a scope on the Rail Gun, Quake 3 Arena's equivalent of the Sniper Rifle. Because Unreal Kart features a Sniper Rifle with a scope, as well as a long jump trajectory to reach the sniping platforms, having just one approach angle to the platforms created unbalanced, sniping-heavy gameplay. The solution to this problem is two-fold. First, additional approach angles make it much more difficult for a single sniper to hold a platform. 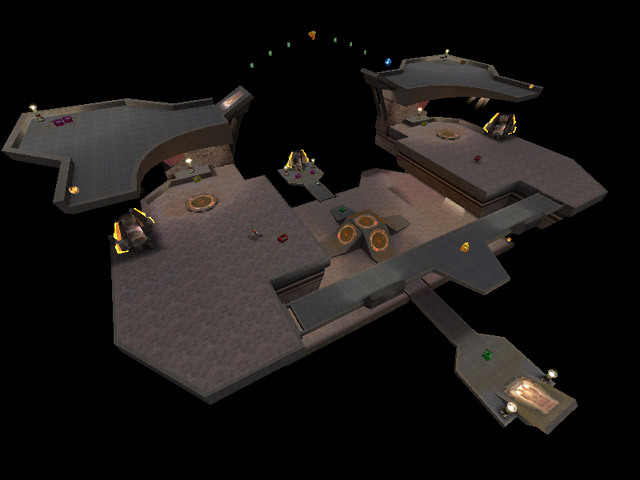 The track allows players to reach the platform from the side via hoverboard, while a number of teleporters in the center provide instant access, dropping players off at the back of the platforms. Second, large mushroom clusters sit directly between the sniping platforms and the center of the level. The stalks of these mushrooms break up the sniping sight lines, and also provide a cool visual moment when players use the jump pads leading to or from platforms, as they go sailing over the mushroom clusters. 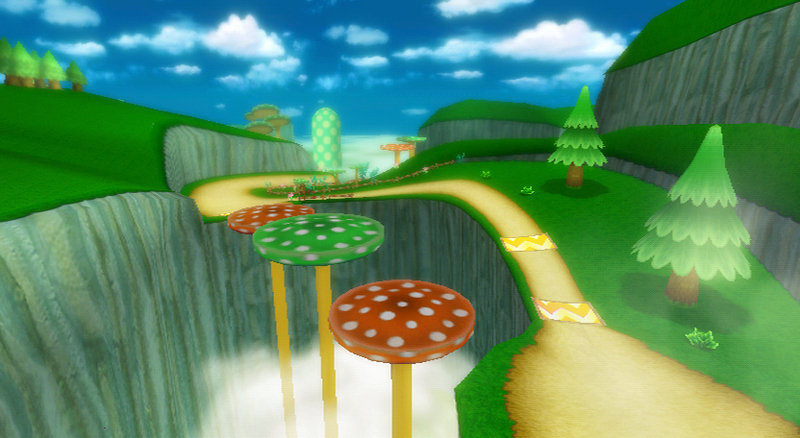 Mushroom Gorge, a level from Mario Kart Wii, provided the primary aesthetic inspiration for Unreal Kart, especially custom assets such as the mushrooms, mushroom stalks, and boost panels. Item boxes are one of the most iconic visual elements in the Mario Kart series, and are critical to selling the visual theme. The material for the item boxes uses a simple diffuse with 6 bright colors, one for each face of the cube. The combination of a checkerboard opacity map and backface rendering allows the colors to blend together to create the eye-catching shifting color patterns. The boxes are interp actors set to rotate constantly on all 3 of their axes, creating a seemingly random rotation. The item boxes disappear and reappear based on the availability of their pickups. More details on item box implementation are available on my Kismet scripting page.